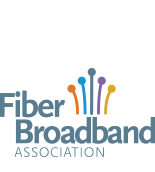 The most recent press releases from the Fiber Broadband Association. The Fiber Broadband Association (FBA) is pleased to announce Black & Veatch as its newest premier member. This morning, the White House released the American Broadband Initiative Milestones Report. It outlines multi-agency plans to increase broadband access in rural America. The Fiber Broadband Association welcomes the release of the report from the Departments of Agriculture and Commerce. The Fiber Broadband Association (FBA) is pleased to announce United Kingdom-based HellermannTyton as its newest member. HellermannTyton is a global manufacturer of cable management, identification, and network connectivity solutions — including fiber. Today, the Fiber Broadband Association (FBA) welcomes Render Networks as a new member. Render Networks (Render) is a network construction software company focussed on innovating the way fiber networks are delivered. Today, the Fiber Broadband Association and RVA, LLC released a new report on the rapid growth of the North American fiber broadband industry. On a webinar, Mike Render, President of RVA, LLC, shared that fiber deployment has reached record highs in 2018.